A conjunction is a word that joins two or more words, phrases, or clauses. Think of them as gluing words. They glue words, phrases, and clauses together. If you'd like to have your friend bring music and snacks to your party, it's pretty hard to do it without a conjunction. Do you see how the conjunction and glues the words music and snacks together? What is a conjunction? It's a word that joins words, phrases, or clauses. Okay, read this question and then try to answer it with your eyes closed. What is a conjunction? How did you do? Did you remember that they join words, phrases, and clauses? Let's look at a few more examples. Clauses: Marianne planted a flower, and she watched it grow. In all of those examples, we used the conjunction and, one of the most common conjunctions. But, of course, there are many more conjunctions out there. All conjunctions perform the same basic function (gluing things together), but there are three types of conjunctions, and you'll be learning about them next! See a list of these conjunctions here. There are only seven of these. Some people remember these with the acronym FANBOYS. They glue together sentence elements that are the same. Two independent clauses: You must study, or you won't learn grammar. 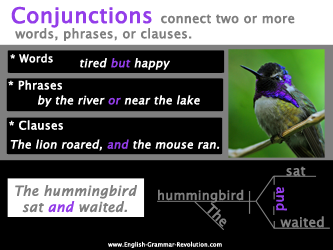 This sentence diagram shows a coordinating conjunction joining two independent clauses. Click here to learn more about diagramming coordinating conjunctions. Those are not complete sentences. They all have subjects (you, I, you) and verbs (are, see, are coming), but since they can't stand alone as complete thoughts, they're subordinate clauses. An independent clause is also a group of words with a subject and a verb. But, unlike a subordinate clause, an independent clause can stand alone. I will bring my cat. I won't bring my cat. These are all complete sentences. They all have subjects (I), verbs (will bring, sneeze, won't bring), and they can stand alone. Subordinating conjunctions let us join subordinate adverb clauses with independent clauses. I will bring my cat unless you are allergic. Whenever I see your cat, I sneeze. Since you are coming, I won't bring my cat. My mom smiled when I made dinner. 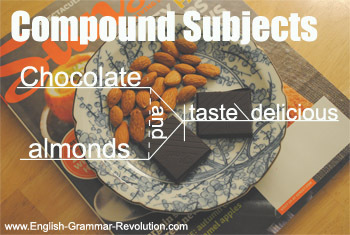 Learn more about diagramming dependent adverb clauses and subordinating conjunctions here! 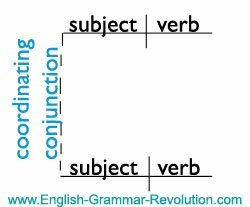 Correlative conjunctions are used in pairs (either...or, both...and), but they have the same function as coordinating conjunctions. That means that they join things that are the same. Both David and I are allergic to cats. Either Mom or Dad will pick you up. He is both intelligent and good-natured. Chocolate and almonds taste delicious. You've been working so hard learning about conjunctions. Now you should go and have a snack. Here's what I recommend. Yum! Now you can answer all of those people who keep asking you, "Excuse me. What is a conjunction?" I love your book! I have used your materials to prepare for a Praxis test, and I did well thanks to you. What is a conjunction? Find the coordinating, subordinating, and correlative conjunctions in this worksheet!